Silent Dancing is a personal narrative made up of Judith Ortiz Cofer’s recollections of the bilingual-bicultural childhood that forged her personality as a writer and artist. The daughter of a Navy man, Ortiz Cofer was born in Puerto Rico and spent her childhood shuttling between the small island of her birth and New Jersey. In fluid and incisive prose, as well as in the poems that elaborate the narrative, Ortiz Cofer has created an important addition to women’s and Hispanic literature. Silent Dancing has been awarded the 1991 PEN/Martha Albrand Special Citation for Nonfiction and has been selected for The New York Public Library’s 1991 Best Books for the Teen Age. JUDITH ORTIZ COFER a poet, novelist, and essayist, is the author of numerous award winning books, including An Island Like You: Stories of the Barrio (Orchid Books 1995, Penguin, 1997), recipient of the 1995 Pura Belpré Award, The ALA Best Books for Young Adults and The Jotn Book/Fanfare Best Book of the Year List. Silent Dancing: A Partial Remembrance of a Puerto Rican Childhood (Arte Público Press 1991) received a PEN citation, the Martha Albrand Award for non-fiction, and a Pushart Prize for the essay “More Room.” She is the recipient of the 1999 Paterson Prize for Books for Young People for the book The Year of Our Revolution. 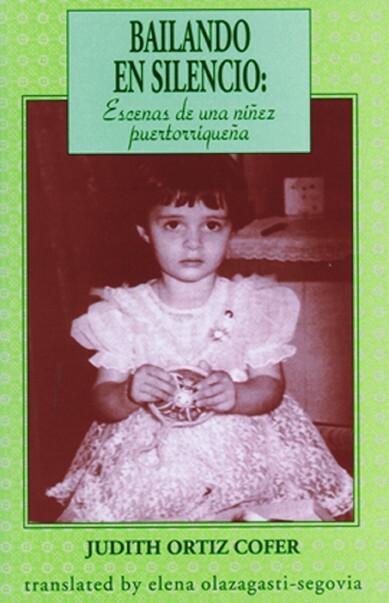 Most recently, she has published a bilingual book for children, ¡A bailar! / Let’s Dance! (Piñata Books, 2011);Animal Jamboree: Latino Folktales / La fiesta de los animals: leyendas latinas (Piñata Books, 2012), a bilingual collection of Puerto Rican folktales for middle readers and The Poet Upstairs(Piñata Books, 2012) an inspiring picture book that demonstrates how poetry can change the world. She lives in Athens, Georgia, where she is a professor of English and Creative Writing at the University of Georgia.